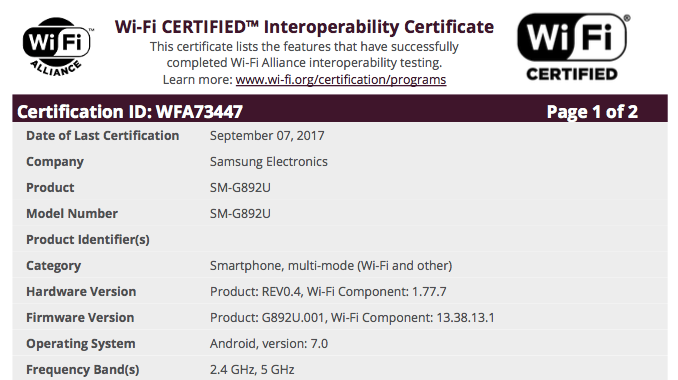 An unannounced variant of the Galaxy S8 Active has been spotted on the Wi-Fi Alliance’s online database. The handset’s model number (SM-G892U) is similar to the one assigned to the standard model (SM-G892A), which hit the shelves last month, though the inclusion of the letter U leads us to believe it’s an unlocked version. If that turns out to be the case, the Galaxy S8 Active will be the first Active-branded device to launch outside of AT&T since the Galaxy S5 Active. There’s also a chance it could make its way to other regions, including Asia and Europe—but that doesn’t seem as likely as it hitting the open market in North America. The Galaxy S8 Active is near-identical to the Galaxy S8; it sports the same Snapdragon 835 processor, 4GB of RAM and 12MP rear-facing camera. However, Samsung has switched the meagre 3,000mAh battery for a 4,000mAh one, and replaced the elegant glass body with a military-grade polycarbonate shell. We have to say, this news is hardly surprising. When AT&T announced the Galaxy S8 Active back in August, it revealed that it would only exclusively offer the handset for a limited time, instantly sparking a mass of rumors claiming it will be available somewhere else in the future. It’s beginning to look like they’re right. It will probably be well received in other countries, because it does not have the Edge display, which although it is beautiful, is well criticized as usability. It would be nice to see the Galaxy S8 Active in Brazil. The last model of this series that arrived here was the Galaxy S4 Active.